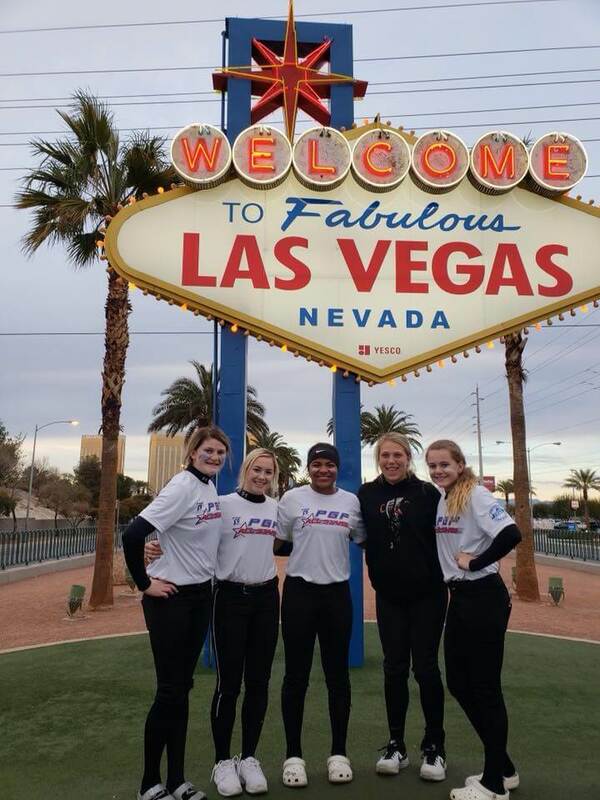 Last weekend, several of the Tennessee Mojo 04 - Fisher players guested on the PGF All-Stars team in Las Vegas. From left to right: Taylor Pannell, Jolie Adams, Mia Williams, Keagan Rothrock, and Jaydyn Goodwin. Taylor Pannell--a third baseman/shortstop from Milan, Illinois and one of the Top 10 players in the Class of 2022 Elite 100 rankings -- was the final piece in the creation of the Tennessee Mojo 14U team that will be coached by Josh Fisher in 2019. That addition to the team was Taylor Pannell. We first got to meet the standout outfield in an Extra Star Power feature that we published in March, 2018. 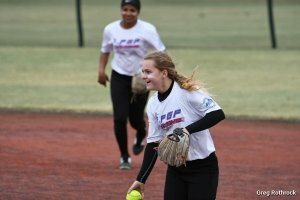 Since then Taylor has written for us on topics ranging from why it's so important to return to So Cal for the PGF Nationals to the importance of role models (and how others feel she is one). I have been so excited since joining Mojo because I get the chance to play with my new teammates that I would have never had a chance to play with on the same field until now. Also, I get to be myself around my new teammates because they are like my sisters and they have the same goals I do. I like the fact that you always can improve on the field, but a softball bond is something you need for a team to be successful and I believe that is what brought this team together. Softball to me is like my getaway because once you show up at the game it doesn’t matter what is going on at school or at home. You show up and have fun playing the game you love with your sisters by your side. I couldn’t be prouder to be playing with my 11 Mojo sisters.! This season I am looking forward to be traveling the country with my new teammates, who all are very talented players. Also, I’m looking forward to playing a competitive schedule because I feel that will push us and make us a better team. 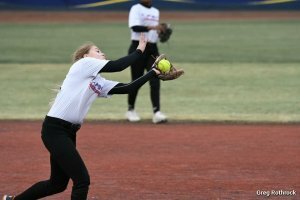 Making a catch in the infield. This summer will make me a better player because I will be challenged with our schedule and my talented teammates. This summer will also be a good one because this team is so well-rounded team and I strongly believe we will have a strong chance at winning PGF Nationals in Huntington Beach, California. If not, we’ll have fun trying! I’m looking forward to this upcoming season with the Mojo for many reasons, the main one being that I believe all of the girls have the same mindset and goals going into the season as well as the coaches. I’m also looking forward to watching all of these talented athletes come together as one and compete against other top athletes. 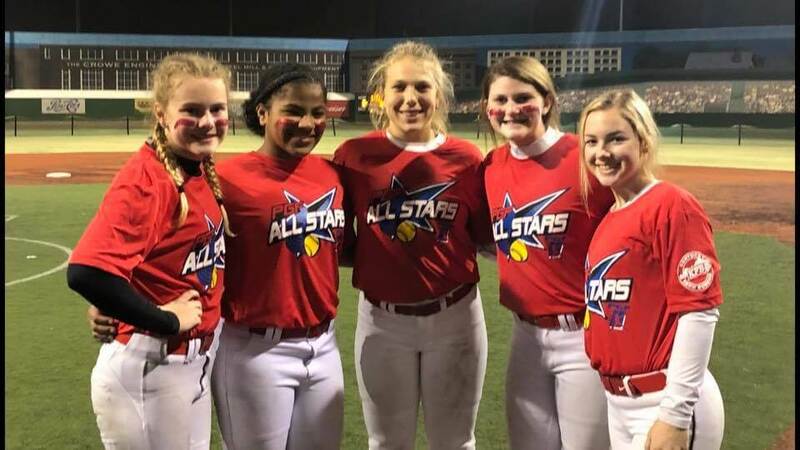 Mojo 04 players playing with PGF All-Stars in Las Vegas (l-r): Keagan Rothrock, Jaydyn Goodwin, Jolie Adams, Mia Willams and Taylor Pannell. I really look forward to playing with the best of best and becoming a better player and I can’t wait to meet my new teammates and just have a blast on and off the field with them. This spring and summer season I am looking forward to many things including creating new friendships that will last forever. I’m also looking forward to getting better as a person and a player. Lastly, I am looking forward to making a great run at PGF nationals in the summer of 2019. I’m looking forward to playing with the Tennessee Mojo because it’s gonna give me the chance to play with some of the most talented athletes at the 14u level. Competing in some of the top tournaments in the country and lastly playing on a very talented team that could make a very strong run at a national Championship. I'm looking forward to a lot of things this summer while playing for Tennessee Mojo. One thing I'm most excited about is meeting my new teammates! Playing with this talented group of girls and competing at the best tournaments, will take our game of softball to a higher level. My main goal this summer is helping my team compete and take 1st place at PGF! I am looking forward to playing with a very talented group of girls where we all push each other to be better. I am also looking forward to playing with and against the best competition in the country which will help us achieve our goal of competing nationally. I am looking forward to all of the competition that we will be facing. I feel like we have a jam up roster for this upcoming season and I know with the level of talent that we have and the love that we all share for this game, we are going to be one of the top competitors for this spring and summer!!! This upcoming season with Tennessee Mojo I look forward to winning with an awesome and talented group of girls who have and share the same goal. I’m looking forward to playing with some of the strongest girls brought together to form one strong team.